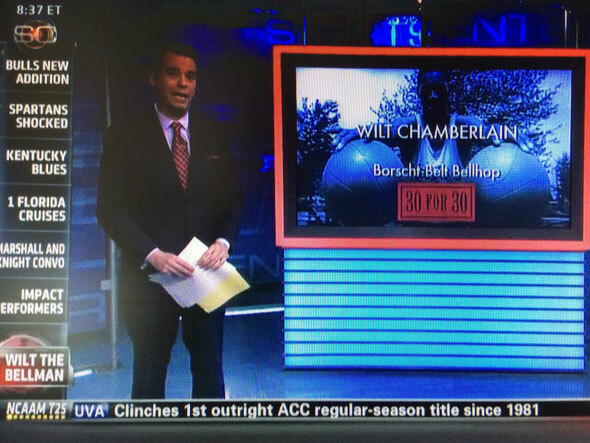 Wilt Chamberlain: Borscht Belt Bellhop is part of ESPN Films' 2014 Emmy-winning series 30 for 30 Shorts! Read about it on ESPN and Grantland. 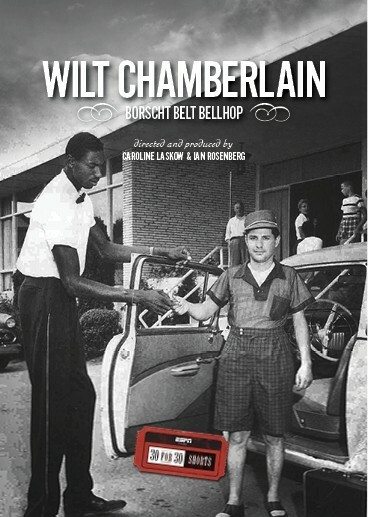 Wilt Chamberlain: Borscht Belt Bellhop is now available for download on Amazon and iTunes, and on DVD as part of ESPN Films' 30 for 30 Five Year Anniversary Collection. Upcoming Broadcasts: Click here for future television broadcasts. Broadcasts: Olbermann on ESPN2 (December 3, 2013 - Listen to Obermann podcast of the broadcast: here); ESPN's SportsCenter (2014); ESPN U; ESPN2; ESPN (2015). TFF Screenings Info here - SOLD OUT! Over 20 Festival Screenings: Jerusalem Film Festival (July 2013); San Diego Jewish Film Festival (August); DocuWest (September 13, 14); Big Eddy Film Festival (September 21); Annapolis Film Festival Shorts Crawl (September 22); Dallas Video Fest (October 13); Hot Springs Documentary Film Festival (October 13); 15 Short Film Festival (October 20); Stanford Alumni Film Festival (November 2 in LA; November 6 in NYC) ; Hong Kong Jewish Film Festival (November 17); Cherry Hill Volvo Jewish Film Festival (December 9); Museum of Fine Arts, Boston (December 31); Palm Beach Jewish Film Festival (January 19 & 20, 2014); Atlanta Jewish Film Festival (February 2 & 9); Charlotte Jewish Film Festival (March 5); International Jewish Film Festival of Eastern CT (March 23 & 24); Toronto Jewish Film Festival (May 2); Finalist for the Robinson International Short Film Award (May 7); Cleveland Jewish FilmFest (September 7); Philadelphia Jewish Film Fest (November 16); Rockland International Jewish Film Festival (April 14, 2015); Chester County Summer Shorts Film Festival (August 19). Press: Variety; Filmmaker Magazine; The Jewish Week; Sports Illustrated ("Best Plot That Reads Like a Dream Journal Entry"); The Times of Israel (an "especially noteworthy" part of the Jerusalem Film Festival). 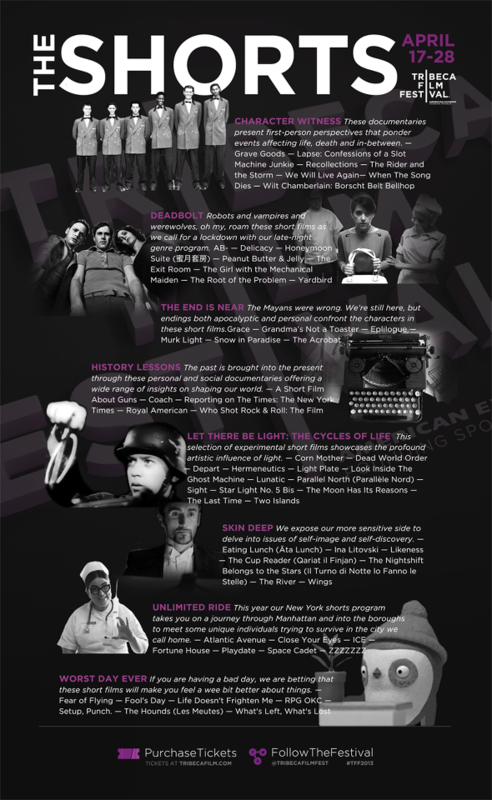 The Independent picks "Wilt" as one of its 5 Critic's Choices of the 2013 Tribeca Film Festival Shorts program! Keith Olbermann hails the film as: "Outstanding!" Jewcy.com calls the film: "AMAZING"! 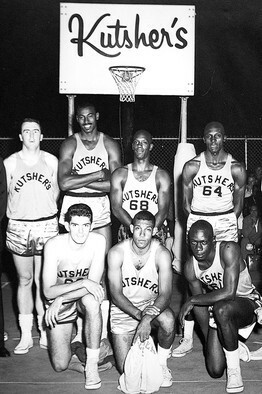 In 1954, before his senior year of high school, Wilt Chamberlain took a summer job that would change his life. He worked as a bellhop at Kutsher’s Country Club, a Jewish resort in the Catskill Mountains. By day he was making $2 an hour and getting great tips from the awestruck guests as he lifted their luggage through a second floor window while standing outside on the ground. At night, he played on the Kutsher’s basketball team and was coached hard by the resort’s athletic director, the soon-to-be legendary Red Auerbach. Mixing rarely-seen archival video and interviews with people who lived and worked with Wilt during that magical summer, this documentary short reveals an unexplored and pivotal chapter in the life of one of basketball’s greatest players, and a fascinating glimpse of a time when a very different era of basketball met the Borscht Belt in its heyday. Directors Caroline Laskow and Ian Rosenberg have been documenting the Catskills since 2007. Wilt Chamberlain: Borscht Belt Bellhop was commissioned by ESPN Films for their 30 for 30 Shorts series, following the success of the filmmakers’ award-winning feature documentary Welcome to Kutsher’s: The Last Catskills Resort. Welcome to Kutsher’s covers the over 100 year history of the legendary Borscht Belt hotel from its birth to recent closure, and was released by Menemsha Films on DVD & VOD in 2015.